No account of Nanking would be complete without reference to Li Yu 李漁 (李笠翁, 1610-1680) who published The Arts of Living 閒情偶寄 in 1671, when he was sixty.. The following extract from T.C. Lai’s Chinese Food for Thought first appeared in Renditions, no.9 (Spring 1978): 47-61. 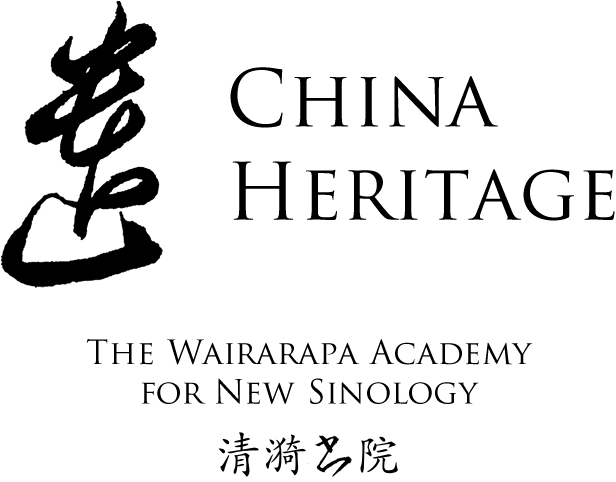 It has been altered to conform with the in-house style of China Heritage Annual. Li Yü, 1611-1680, dramatist, poet, and essayist. At the age of thirty, he devoted his life to writing. Dependent entirely on his pen to support a household of forty members, he was compelled to seek the patronage of high officials, and for that purpose traveled extensively. Wherever he went he produced plays which were performed in the houses of high officials by a troupe of singing girls whom he maintained. He built the so-called Mustard Seed Garden. He wrote charming essays and comments giving his ideas on dramatic composition, methods of acting, feminine charm, notes on architecture, travel, recreation, diet and hygiene. Li Yü possessed great creative talent and a keen sense of humour. All his writings have an original and entertaining quality: the expression bold and free, the language simple and easy. Admittedly certain parts of the body are quite indispensable — the eyes, ears, nose, tongue, hands and feet and so on. But I consider that the mouth and the stomach do more harm than good. It was a mistake for nature to endow us with them. They make life complicated and give rise to crime. Laws and penalties were made because of them. Plants have no mouth or stomach but there is nothing to prevent them from growing. Rocks do not eat or drink but they perpetuate without any trouble. Why then should there be such organs as the mouth and the stomach? Granted that they must have their places, they should only serve such purposes as they do for fishes and shrimp or dragonflies. While we will do what we can to minimize the evil, we cannot but blame nature for her mischief. Since we are stuck with our mouth and stomach we will have them serve our purposes instead of serving them. Hence my thoughts on the subject of food. People who talk about the virtues of vegetarian food mention only their purity, cleanliness, fragrance and crispness. They do not realise that the one quality that makes vegetarian food superior to meat is its freshness and delicacy, but the pleasure can only belong to mountain monks and rustic farmers who attend to their orchards and gardens personally: not to the city dwellers who depend on vegetable vendors for their daily supplies. This is particularly true of the bamboo shoot that derives its particular fragrance and delicacy from the mountain air. It is the queen of all vegetables; even the best lamb and pork pale before it. Cook bamboo shoot with any meat and you will find on serving that people prefer the bamboo shoot to the meat. Than live in a place with no bamboos. Without bamboos one becomes vulgar. Except for bamboo shoots, there is nothing more palatable than mushrooms, which, having no roots, spring to life suddenly as if from the void. It is the essence of wild nature. It is form but no substance- when one consumes it one imbibes the essence of nature. How can it fail to be beneficial to health? ginger and vinegar. It has a neutral taste and goes well with anything rich because it absorbs the taste of the principal ingredient in a dish. These are the three vegetables with a highly pungent aroma and taste. In spite of their intense and disagreeable smell, they are fancied by many people. I myself treat the three things differently. I avoid garlic but use spring onion sparingly. As for leek that which is young like sprouts is not only non-smelly but has a clear fragrance. It is like an unspoiled child. There is a well-known saying ‘meat eaters are despicable.’ They are not despicable for eating meat but for being numbskulls. The reason why meat eaters are muddle-headed is that their mind’s openings are blocked by the grease which meat produces. This is not pure nonsense. Consider the vegetarian animals. Compared to the tiger which is meat-eating, they are sagacious and clever. The tiger is the most stupid of animals; it does not eat small children because they think children are brave, not realising that they are ignorant and therefore not afraid of the tiger. It does not eat drunken people, mistaking them to be aggressive without realising they are only inebriate. I have tried to find out the reason for the animal’s stupidity and my conclusion is that it eats nothing except meat. Its mind is blocked and cannot function properly. The saying, ‘Meat eaters are despicable because they have no foresight’, is not without foundation. I never have difficulty in describing the virtues of all kinds of food except the shell-fish which we call crab. I think a lot about it but I have never been able to describe why I delight in it, although I love it to distraction. Before crabs are in season I always save up money to await its advent. My family used to tease me about my obsession with crab, saying crabs are my life. So I called the money thus saved for buying crabs ‘life-buying money’ 賣命錢. From the first day crabs appear in the market to the day when they disappear I never go without them at meals. The tenth day of the Ninth Moon is an important date. It is then that I usually go for crab feasts with friends who know my predilection. It is also the day when I start preserving crabs by putting them in tsao or grain-dreg. I used to have a maid-servant who attended to the care and cooking of crabs. The beauty of crab as a delicacy is often spoiled by people who mistreat it. To use it in a soup is to ignore its texture, although it will still taste good. To finely hash it will destroy its real taste although its richness remains. What’s worse is to cut it up, marinade it and then sauté. In this way, the colour, the flavour and the taste are all destroyed beyond recognition, as if the maligner were doing that out of malice, jealous of its fine qualities. Many things are best when they are alone. The crab’s taste, flavour and colour are fine beyond compare. To try to improve its taste by the addition of other ingredients is like trying to make the sun brighter by lighting a fire. Thus the best way to enjoy crab is to steam it whole, then serve it in a tray. You can then break it up bit by bit, and only break as much as you can eat at one time. In this way, all the goodness of the crab is preserved. Like eating melon seeds, we must do the ‘opening’ and ‘breaking’ of the shells ourselves in order to truly enjoy them. The same principle applies to incense which we must personally attend to, and to tea which must be brewed with our own hands. As long as there is rice there should be soup. The relationship between soup and rice is like that between water and a boat. When a boat is stranded on a sand bank only water can wash it back to the river; rice goes down much better with soup. I would go so far as to say that it would be better to go without all main dishes than to have no soup. Fruits and tea are enemies to wine. That is why those who are fond of wine are most likely haters of fruits and tea. The best test of a person’s drinking ability is to give him some fruit and candies. If he likes eating these, he is a tea drinker not a wine drinker. This has proved to be an infallible test. For more on the prodigious writer, translator, artist and gourmand T.C. Lai, and an oral history interview with him, see Lingnan University Digital Commons, here: http://commons.ln.edu.hk/oh_cca/18/. The site also features a bibliography of T.C. Lai’s writings, translations and criticisms. For more translated work by T.C., visit the Renditions site at: http://www.cuhk.edu.hk/rct/renditions/index.html.